With spring in full effect here in the Pacific Northwest I am finding myself craving all of the foods I longed for over winter. Bright green foods that are fresh and packed full of flavor. 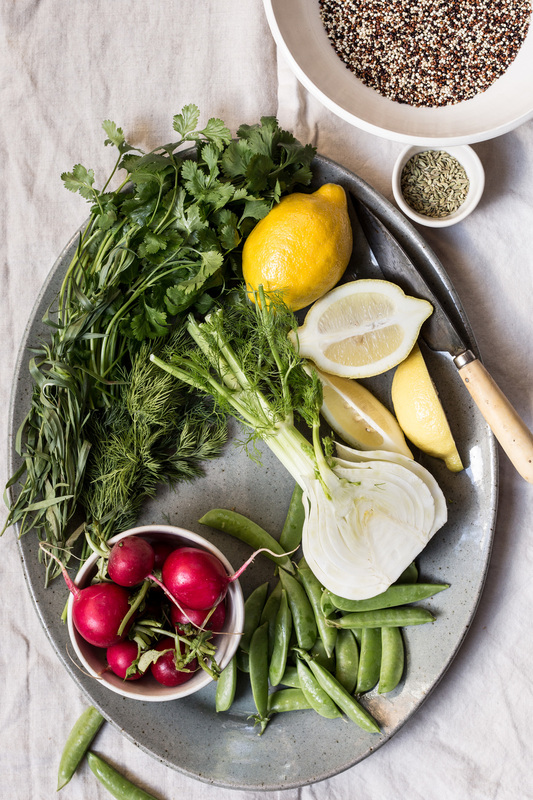 From asparagus, to dandelion greens, snap peas, radishes, and fennel. This salad is a combination of some of my favorite foods, and really, my favorite way to cook. By simply making up a batch of grains, adding raw thinly shaved vegetables and packing it full of a variety of herbs. Mix in some gorgeously pink salmon, and top it off with even more herbs made into a salsa verde sauce. For this salad, and like most of my recipes, use this simply as a guide. If quinoa is not your grain of choice, farrow or wheat berries would work great. When cooking your grains, always be sure to throughly rinse them using a fine mesh sieve. And really get in there with your hands and toss the grains around while be rinsed. From there, before you add your liquid to the pot, let the grains toast first in a little olive oil for about 1-2 minute until they begin to start popping around in the pot. Then, add your stock. Using stock for cooking grains is my favorite way to add in that extra flavor. I do this with not just quinoa, but rice as well. And sometimes I’ll even add in a handful of spices and herbs in the pot as well. For this recipe I used Progresso Vegetable Cooking Stock which is made from celery, onions, carrots, cabbage, parsley, leek, thyme, garlic and bay leaves. 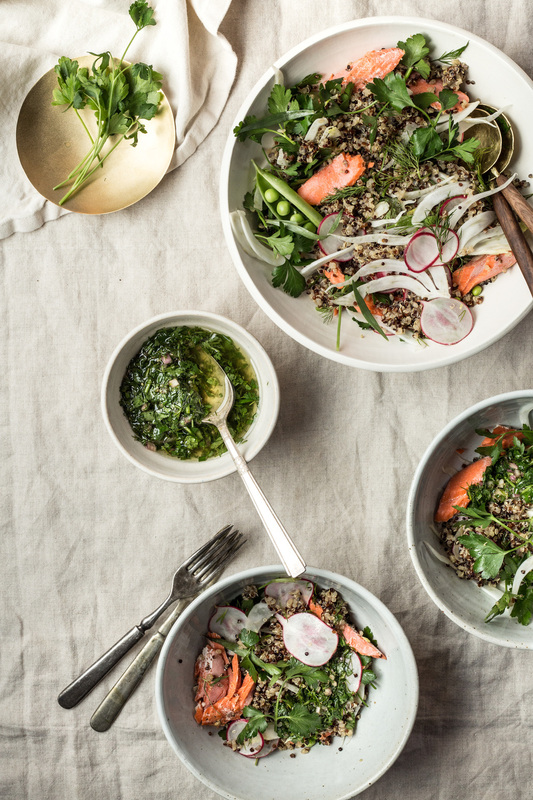 It turned your everyday quinoa into a dish that was rich in flavor, fluffy, and the perfect component to this spring salad. This post is sponsored by feedfeed and Progresso, all thoughts and opinions are my own. Thank you for supporting. Preheat oven to 250 degrees. Place salmon on a large baking dish or sheet and coat with oil. Season both sides with salt and pepper. Place the salmon skin side down and sprinkle with caraway seeds, if using. Bake for 25-35 minutes, begin checking around 25 minutes for doneness. The fish should be opaque and easily able to flake. Using 2 forks, simply break up the salmon into large bite size pieces. Rinse the quinoa in a fine mesh strainer using your hands to rub the quinoa as it rinses. Using a saucepan over medium high heat, add the oil and then the quinoa and toast for 1 minute. Add the stock and salt and bring to a boil. Cover and turn down the heat to a simmer and cook for 15 minutes. Remove the pot from the heat and let stand for 5 minutes. Remove the lid and fluff with a fork. Place the quinoa into a large mixing bowl and allow to cool. 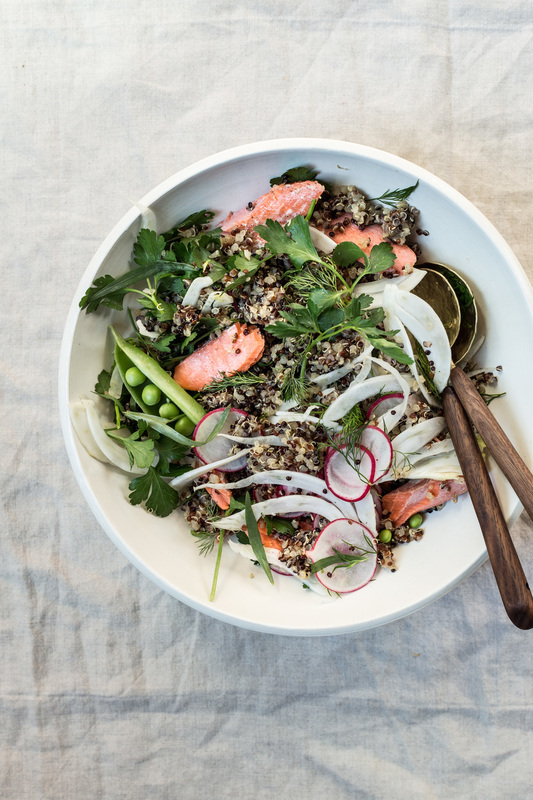 Once the quinoa is cool, add the radishes, fennel, red onion, snap peas, parsley, basil, cilantro, dill and tarragon and toss together. In a medium bowl grind together fennel seeds, coriander, cumin brown sugar, kosher salt, garlic, and red chile flakes. Add chives, parsley and dill and mix together. Whisk in the sherry vinegar and olive oil. To serve, add the salmon to the herbed grains and top with salsa verde.